It is only in the last year or so that I have discovered the wonders of salad for lunch. It is healthy, low in calories, and because it is not loaded with carbohydrates it helps to keep you from being tired in the late afternoon. But when you are at work or on the go it is hard to remember to pack a salad... not anymore! Julia Mirabella was trying to figure out a way to eat healthy at work, she came up with the idea of pre-mixing salads for the week in Mason jars. Mason jars are inexpensive, you can see all of your ingredients, there aren't any plastic contamination issues with glass either. The jars are air sealed which keeps the contents really fresh too. From Julia's book: Mason Jar Salads: 50 Layered Lunches to Grab and Go I made this Apple and Frisee Salad in a Mason jar the night before, and ate it for lunch the next day. It appeared to be fresher than when I've stored cut food in plastic containers. It was also incredibly delicious. Julia balanced the sweetness of the apples with the bitterness of frisee and the filling flavors of goat cheese and walnuts. 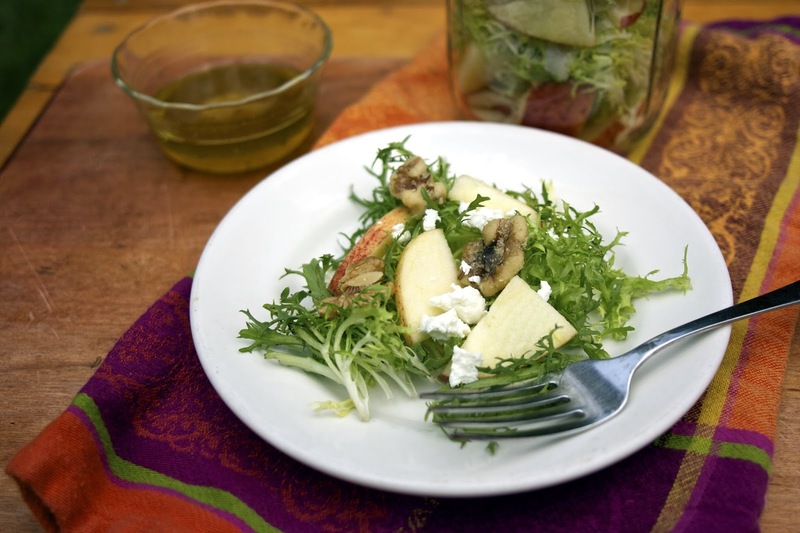 Terrific apple cider vinaigrette with honey that blended all of the ingredients really well. If you want to eat healthy at work or you have little kids and never find the time to make your own good lunch... get this cookbook! When summer begins to turn into fall, apples arrive at the farmers’ markets and you know it’s time for some apple-based salads. 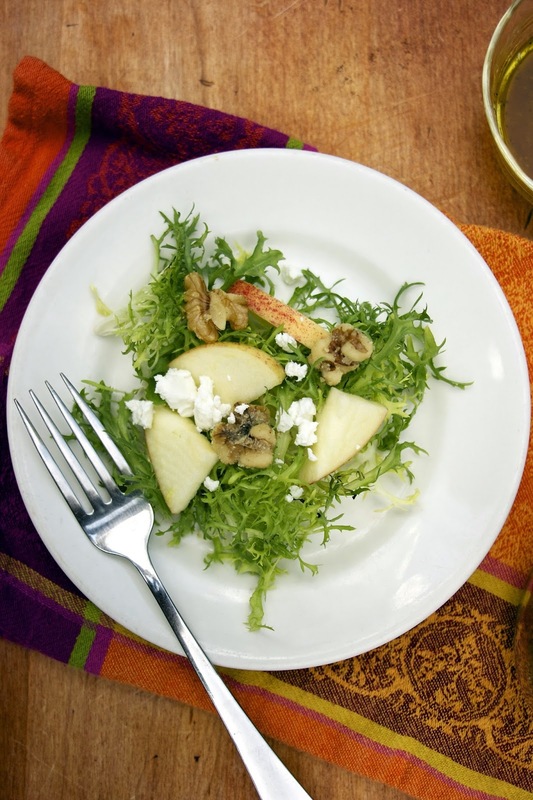 Apple and frisée salad is simple to make but shouldn’t be underestimated, and it’s a great way to get your fill of freshly harvested apples while you can. The apples won’t turn brown as long as you pack everything tightly so there isn’t too much air in the jar. Core the apple and slice it into thin pieces. 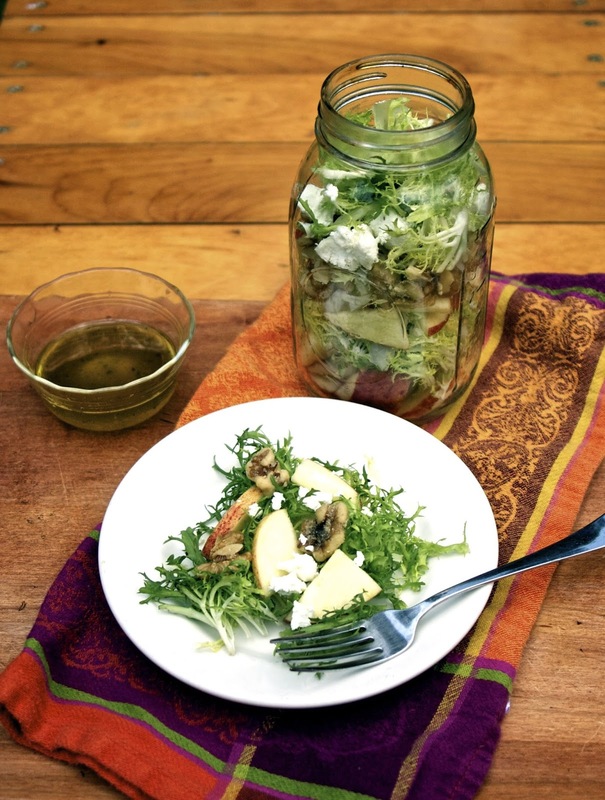 Place the apple slices in the bottom of the Mason jar and top with a cup of the frisée, then layer on the shallots, another cup of frisée, the walnuts, and the rest of the frisée. Finish with the goat cheese. Make a parchment paper cup on top for the vinaigrette (see page 14), or carry it separately in a small container. Whisk together the vinegar, honey, salt, and pepper. Slowly add the olive oil, whisking, until the dressing thickens. Wednesday: Summer Vegetable Soup and Rustic Bread. The jar I think is more to make them appealing and easy to layer. It is also more air tight if you are preparing a lot in advance...easier to see jars. But whatever works for you, the recipes are really delicious in this cookbook and you can store them anyway you choose. What a great collection of Mason Jar Salads and I love your menu for the week. Hope you are having a great weekend and thanks so much for sharing with Full Plate Thursday. Yum! Love salads in jars and this one looks amazing! Thank you so much for linking up at Tasty Tuesday! Your recipe has been pinned to the Tasty Tuesday Pinterest board! Please join us again this week!